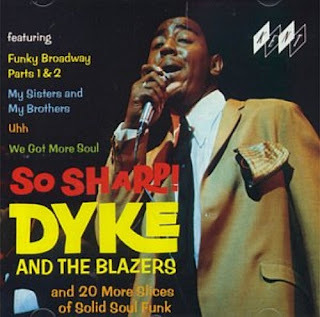 "Dyke & the Blazers were one of the first acts -- possibly the first notable act -- to play funk other than James Brown. Indeed, they often sounded like a sort of junior version of Brown and the JB's, playing songs in which the rhythms and riffs mattered more than the tune. Similarly, vocalist Dyke Christian sang/grunted words that mattered more for the feeling and rhythm than the content. Their best-known track, "Funky Broadway, " was covered for a bigger hit by Wilson Pickett, though Dyke & the Blazers got a few more R&B hits before Dyke was shot to death in 1971. Arlester "Dyke" Christian was born in Buffalo, NY, in 1943, and by the mid-'60s was singing and playing bass with the O'Jays backing band, the Blazers. Dyke and some of the other Blazers were stranded in Phoenix when the O'Jays' couldn't afford to bring them back to Buffalo, and the Blazers based themselves in Phoenix, having no means to travel elsewhere. Their "Funky Broadway" was released on the Phoenix indie Artco in late 1966, and picked up for distribution by the L.A.-based Original Sound label. It became a sizable R&B hit (and a small pop one), and may have been the first record to use the word "funky" in the title. As with James Brown, Dyke & the Blazers' records sold far better, and charted much better, with the R&B audience than the pop one, which was for the most part unaware of the band. In the late '60s and early '70s, Dyke and the band issued a series of gut-bucket funk singles with scratchy guitar riffs, greasy organ, hoarse vocals, and jazzy horns; all traits that James Brown and his band had developed, admittedly. But Dyke did the style well (right down to issuing several two-part singles), although not with a great deal of variety. For some of his sessions, Dyke recorded in Los Angeles with musicians who would later play in the Watts 103rd Street Band (guitarist Al McKay would later be in Earth, Wind & Fire). According to Original Sound producer Art Laboe, most of the singles came from 15-to-20-minute jams that were edited down to a length that could fit on the 45 RPM format. Dyke & the Blazers had Top Ten R&B singles with "We Got More Soul" and "Let a Woman Be a Woman -- Let a Man Be a Man" in 1969, and smaller sellers with "Uhh, " "You Are My Sunshine," and "Runaway People." Dyke Christian, sadly, was fatally shot on the street in Phoenix on March 13, 1971. " nice one man! I've got a few of these on 45. Hi there...just stumbled across yr blog & IT'S F**KIN' A+++++++! Great to have a blog that really DOES stick to it's title. Pure genius. Thanx for puttin me on to some great new sounds & I'm lookin forward to whatever comes next! As the old adage goes..."Keep on keepin' on"! I have never heard about Dyke before, they made a wonderful music. I'll enjoy a second time, it will not be the last. Thank you.